This TiGer cub is a budget version of the well-known bigger Scheppach grinders. The most obvious difference is the use of a plastic casing. This might allow some flexing of the jig mounting bar and it is important to check that the bar is parallel to the grinding surface. The version I tested was a prototype and I am told that the manual will be improved on both the translation and content front. The machine was very simple to set up, needing only an 18mm spanner to tighten the wheel retaining nut. The wide water trough was easier to fill when fitted than some of the other makes that I have used. 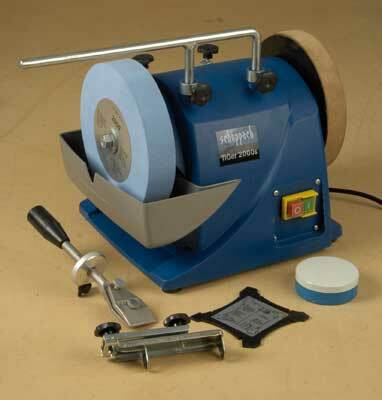 The basic machine comes with a universal jig for plane blades and chisels. The promotional pack for the 2000s comes with a stone grader and a small knife jig as well. A full set of extra jigs can be purchased for scissors, axes, scrapers, gouges, planer irons and so on. A truing tool is also available. Needing to bed in, after switch-on it ran for a few moments then stopped unexpectedly, but a helping push got it going again. I decided to grind a fresh bevel on my No. 5 bench plane. 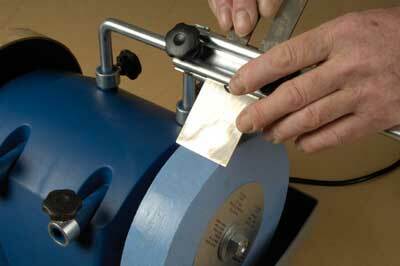 The blade was set up in the pressed-steel jig and offered up to the toolrest. In order to retain the existing bevel, I marked my blade with felt tip and copied the existing grind angle. The TiGer comes with an angle jig that I could have used if I was grinding from scratch. The blue stone made short work of the grind and the edge was easily polished on the leather wheel using the burnishing paste supplied. As an introduction to wetstone grinding with the basic jigs for under Â£100, this represents good value. If bought with the promotional items it has a saving of Â£50 over the metal-bodied version. I suspect that sooner or later you will want to upgrade to its bigger metal brothers, the TiGer 2000 or 2500. Of course being part of the same family, all the jigs will still fit. "As an introduction to wetstone grinding ... this represents good value"